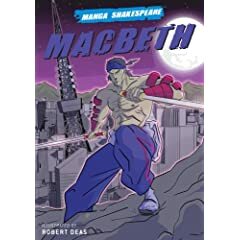 Manga Shakespeare: Macbeth. Illustrated by Robert Deas. 2008. This Macbeth graphic novel is set "in a future world of post-nuclear mutation." (That little fact will explain away why Macduff has four arms.) I'll be honest with you now. I rarely understand or "get" the art and design of the Manga itself. Why set Shakespeare's Scottish play in a post-nuclear-disaster future?...for example. But while I sometimes fail to appreciate the illustrative story that has nothing whatsoever to do with the text of the book itself, I almost always love, love, love the adaptation of the play itself. The series has done a wonderful job in adapting these plays and presenting them in new and imaginative ways. Manga Shakespeare begins with several pages of color art work. Each character is introduced along with a phrase or two that sums up their character or their influence on the play itself. For example, Lady Macbeth's is "But screw your courage to the sticking-place and we'll not fail!" which is a great line to sum up everything she brings to the play. 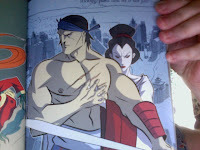 Most of the graphic novel is in black and white. This is an action-filled play. And the text really works well here. Everything that is memorable and important from Shakespeare's original play is presented within the book. (In other words, all the lines that are apt to be on the test or vital to class discussion.) I love that the language is all Shakespeare. I love that the text becomes more accessible because of the format. I think Lady Macbeth is a great example of this. With her well-endowed cleavage, corset, mini-skirt, and thigh-high boots. Her manipulations and insults to Macbeth's manhood (and courage) become even more obvious. MACBETH To know my deed, 'twere best not know myself. I have been thinking about getting my mum some of the Shakespeare manga so she can show the kids in school. Easing her in with her first graphic novel (Persepolis) and will take it from there. I got my mum Macbeth and Frankenstein for her gothic class - not manga but tres cool classical comics. The kids loved them (so do I) and mommy dearest has now ordered Jane Eyre (not my thing) and some Dickens. I want romeo and juliet but they don't have it out until next year.